K looked meaningfully into my eyes from across the table in the charming and cosy cafe in Bandra that we were sitting in yesterday evening and said, "This is what you wanted all your life." She went on to explain, "a neighbourhood store where you can come to for nice cookies and coffee." As usual, she was spot on. I love soft baked chocolate cookies to go with my coffees, and can't get them anywhere nearby in Bandra, not even at our beloved Candies. 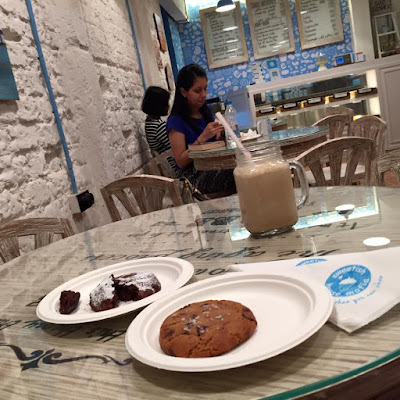 Years back I had written here about how I miss good cookies in Bandra. Seeing that, blogger Allison Hendricks baked some lovely cookies for me from Sydney and got them over. You can see the pictures in this post. We then came across some lovely cookies at the nearby Moshe's outlet (you can read about it here). Sometime later Meghna played secret Santa to me one Christmas at work and introduced me to the delicious chocolate cookies at Kainaz Messman's Theobroma. Then I discovered a charming shop called Ben's Cookies in London's Oxford Street. (You can read about it here). It's a chain which bakes and sells the most amazing soft baked cookies. I packed some for K and got them back to Mumbai. She returned the favour when she went to London a year later. I also spotted a Ben's outlet at Dubai airport when you stop on the way to Europe via Emirates and had a couple of happy pit stops there. For the first time I actually considered claiming my British citizenship rights and giving up my Indian passport so that I could be close to Ben's! Thankfully I don't need to now. A new Sweetish House Mafia cafe has opened beside HSBC in Bandra's Turner Road very close to our house. Sweetish House Mafia was a twitter sensation sometime back. An anonymous lady would send a Nano car across Mumbai selling her very popular cookies under the SHM name. She would announce where the car would be parked on Twitter and customers would rush there for cookies. I never made it then as I was trying to cut down on desserts. They then opened stores at Lower Parel and a counter at Inox in Nariman Point. A few days back my dessert crazy diabetologist friend (!) alerted me to the new Sweetish House Mafia store at Bandra and K and I decided to check it out. The Sweetish House Mafia store at Bandra is a cheerful light blue and white coloured store. They bake the cookies fresh at the basement. They have around five tables with chairs and a bar stool section with three chairs. You can place your order for cookies, coffee, shakes or even milk and have them at the cafe. Or pack the goodies and take them home. A happy place indeed. K and I spent a pleasant evening there yesterday. 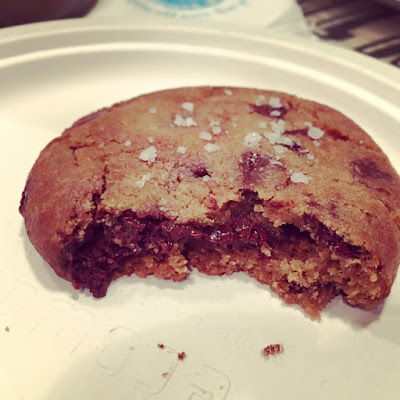 I had the Nutella sea salt cookie which my friend Khushboo had recommended. This is delicious. Soft baked. They heat it just right here making the Nutella filling inside moist. The flavouring is subtle and nice and chocolatey. The hazelnut flavours don't overwhelm you. The addition of sea salt adds an interesting taste dimension and cuts the sweetness. The first time I came across sea salt in a dessert was at Velodroma in Barcelona where I tried the Catalan preferred combination of sea salt, olive oil and dark chocolate on crusty bread and really liked it. K didn't like it as she doesn't like anything interfering with her chocolate but I would strongly recommend that you try this combination. We both loved the dark chocolate truffle cookie. Again soft baked and with some pretty intense chocolate flowing through it. The difference from the double chocolate chip cookie, explained the folks at the counter, is that the chocolate is richer here. They had some interesting price combos going and K had her cookie with a cappuccino which she liked but felt that it could be served hotter. I didn't try it though. I had my cookie with the home made cold coffee. This was delightfully flavoured. Not very strong. They had asked me whether I wanted it strong or mild. The consistency is thin as they don't add ice cream though they can do so on request. The cold coffee was truly old school. Simple, uncomplicated. Giving a lot of joy. The two cookies we tried were about 120 Rupees or so each but they did have cookies at Rs 70 as well. I do see us going back here pretty often whenever our conscience allows and when we give in to temptation. I do know that we will come out smiling when we do.